Irrigation systems consume the greatest amount of water, and the best opportunity to use water intelligently is in the way the irrigation system is installed and maintained. There are also techniques for water usage, although on the surface they may not appear as simple water saving but as an efficient and smart transformation of water from one form to another. Beyond the strictly visual beauty that plants provide in our homes and gardens, they can benefit us indirectly as well. 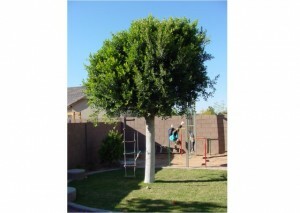 Well located trees and shrubs can more than earn their keep by shading roofs and patios, thus lowering cooling costs. Well sited plants moderate winds and shelter our homes from weather extremes and can screen objectionable views. Water delivered directly to the root zone area of a plant minimizes competition from moisture stealing weeds. Consistent timing of water applied allows plants to develop healthy root systems. Infrequent or erratic watering keeps a plant in a perpetual cycle of minimal growth and bare survival mode. A drip emitter system is the most efficient method of providing this level of reliable water delivery. Lawn grasses also benefit from correct water delivery and timing. Most grasses respond favorably by having their root zones wetted to the right depth depending on the growing season. Only a highly efficient and well maintained sprinkler system can deliver a consistent water application. Watering in the early morning hours is the most effective time of day due to lower evaporation rates and generally calmer wind conditions. Sprinkler head spray patterns can have their shape distorted by gusting winds during the day producing an erratic distribution of water. A consistent watering schedule with the proper amount of water applied promotes a healthy root system that makes your grass more water efficient and able to withstands greater periods of stress related to variable weather conditions. Applying too much water is wasteful and can make the grass area susceptible to fungus or root related diseases. Like trees and shrubs – the frequency of water applied to grass is dependent on the specific soil type the grass is growing in. Sandy soils need more frequent watering then moisture retaining clay soils. When appropriate, adjust the run time for sprinkler areas that have a problem with water runoff by splitting the valve run time into two cycles 30-60 minutes apart to achieve the required watering rate. The amount and duration of the watering cycle should be based on the particular type of grass and local climatic conditions.